The Euros that saw "football coming home" to England in 1996 marked a revolution for Portuguese football. 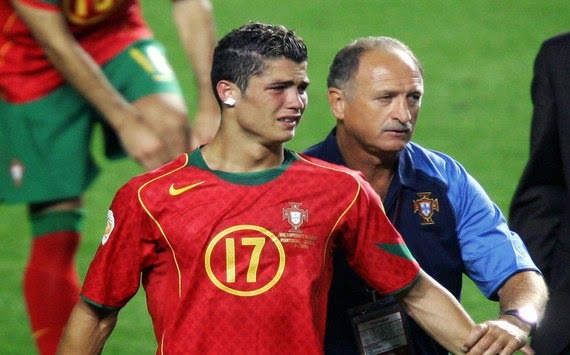 After that tournament, Portugal were present at every major competition with the exception of the 1998 World Cup in France (the start of a trend), with the Golden Generation taking centre stage. The nearly twenty years that followed have seen Portugal progress to two semi-finals and one final, which led many to believe the side would finally be able to be a member of the elite club of European powerhouses. Boasting one of the world's two best players in Cristiano Ronaldo certainly didn't hurt matters; the future looked rosy. What those handpicked stats hide is that Portugal are usually terrible when it comes to World Cups. In 1986, Portugal defeated England 1-0 (the start of another trend) but crashed out after losing to Poland and Morocco, amidst disputes over bonuses and scandals involving prostitution. The tournament yielded bruised egos, one fired coach and a few banned players. In 2002, there were again squabbles over monetary compensation, poor managing choices and seemingly endless shopping sprees (besides defeats against South Korea and the United States). The tournament yielded bruised egos, one fired coach and a few banned players. Luís Figo watches Landon Donovan's celebration at the 2002 World Cup. Only in 2006 did Portugal show up and manage to actually look good (the fact that the competition was played on European soil should not be deemed a random factor), reaching the semi-finals. However, it should be noted that the two opponents Portugal overcame to play Germany in the semi-finals were England and the Netherlands, the only two top teams Portugal have consistently beaten over the past 20 years. Against Germany, France, Spain or Italy, the track record is less than impressive. One of the unheralded advantages of Euros is that if one team qualifies from the group stages, they immediately earn bragging rights about reaching a competition's quarter-finals. If the draw is favourable on top of that, players, coaches and directors (as well as supporters) might even go as far as saying that they've reached the semis. In 1996, Portugal were eliminated by Karel Poborsky's (who would later play for Benfica) expertly taken lob in the quarter-finals. For a nation that had remained absent from tournament finals for so long, it was an honourable display. In 2000, the feared France put the Portuguese out of the tournament at the semi-finals with the penalty that spurred so much controversy throughout the nation (Turkey were the quarter-final opponents). to make sure such moments don't happen once again. The 2004 history is well known, of course, but it hides the fact that the opponents that Portugal defeated were precisely England and the Netherlands - the two teams that have become as close to automatic knock-out wins as possible for the Portuguese side. In 2008, Portugal crashed out against Germany (no coincidences there, then) in the quarter-finals and 2012 saw them being eliminated in the semis via penalty shoot-out at the hands - and feet - of Spain, after losing to Germany once again in the competition's first match. The team the Portuguese had beaten to reach the semi-finals was the Czech Republic. While history might be cast aside as a mere collection of facts, it might help us shed some light on a few tendencies. In this particular case, it seems to show that Portugal fare rather well on European soil (whether it is the Euros or World Cups) and less well on other continents. It also reveals that, contrary to popular belief - and the 3-0 win against Germany back in 2000 notwithstanding - Portugal have consistently failed to punch above their weight and that their best results are usually linked with favourable draws. I have been wondering why nobody had addressed this painful and more than obvious issue. POR generally under performs and always under performs in world cups. When I say under performs I mean getting results that are way below our real capacity and power. You forgot to mention we had great squads in 94 and 98 and that we failed to even qualify. There is a reason for why we have been England´s and Holland´s Bête-noir. And it is perhaps easy to explain by observing which teams are our Bête-noir: it´s France, Italy and Greece. Italy and Greece summarize the nightmare team for Portugal. Very solid defense, no spaces given, clinical finish. Portugal played in build-up attack, not very fast, with little penetration and low scoring/chances ratio. Until CR, that is. The archetype opposite team to what POR was. France is our anti-team. They are never very different than us but they manage to get a win by being stronger mentally, not choking, etc. That´s why it´s always balanced and at the end they win. Often with some scrappy penalty. Plus they have more status than Portugal. England has been overrated for a long time and plays(ed) a long ball 4-4-2 with little technique, which is vulnerable to our 4-3-3, short passing, high technique. Holland gives a lot of spaces, which is really all POR needs, and we defend and overall play better than them. We are ENG opposite and HOL´s anti-team. The poor results against tougher squads is, I think, more mental than real. In 2000 we beat GER with a B team. True, we had the pressure off and they had all the pressure in. But other than that, where was it different than so many times in the past, where "they" were stonger and "we" were weaker? That 3-0 was natural. Bottom line: we are a lot better than we think, but we can´t continue to underestimate "weak" teams nor underestimate ourselves. In fact a winning team never needed to be better. Just needs to figure out a way to win the match. Not to use the match as evaluation of its own level. That´s why POR fails. A more daring Portugal would not have lost against Spain in 2010 in that way. Turkey 2000 and 2008, and the other Czechs, were not bad teams. And now in 2014, even with the tittle, Germany was not 4-0 stronger than us (playing with 10). We just played poor and then had a surreal number of injuries. With a fit full squad, try and take away space for GER2014 to play, force them wide then hit them, and see what happens... This is exactly how THEY beat us so often in the past. In short, I firmly believe that in 94, 98, 2000 and in 2014, not only did we have a squad capable to qualify; we had a squad that could go at least to the final 8 perhaps 4. And if the team chokes, it´s always the coach... He´s not there just to give tactics, etc. Teams are not machines. As you say, in 1996 Poborsky had a great goal. But the truth is that POR had stopped playing. It was sad. I think that if we had played, prepared, etc, now, like we did in 2006, we would have done it. And I´m not so sure it was European vs non-european soil that made the difference. I think the Scolari period was the ONLY period where results matched out potential. We lost 3-2 to Germany in 2008, with a team that was already sort of demotivated and was not as strong as 2006. They beat us showering balls to our box. But they conceded twice. How often do they do that? This problem can only be solved with victories. We are fearless going against Ghana, Turkey, Ivory Coast, and so many other strong teams. Then we boast over Greece, which we don´t beat in 18 years. And then we chicken out when it´s a big one. BUT, more often than not the big one isn´t that big, and does not see us as small as apparently we do. In a nutshell, Vasco, why do you think things happen this way, knowing the problem is most of the times not in the quality of players we have? In the qualifying for 1994, after loosing points away to Scotland and beating Switzerland, we only needed a draw in the final match against Italy (away) to go through. It was an even match, we went for the win and they won 1-0. We stayed home and SWI went to the US in "our" place. SWI reached the last 16, Italy went 2nd. Strangely, when playing a perfectly within reach Czech, Poborsky scored a great goal, against an almost non existing POR team (?). In the qualifying for 98, after loosing points to Armenia and Northern Ireland, loosing to Ukraine (away) and drawing Germany (home), we needed to beat Germany (away). They needed a draw. We were 1-0 up and then mr Marc Batta invented a Rui Costa red card for walking and not running when being substituted (?). We were down to 10 and shortly after Germany equalizes. Germany and Ukraine go through, we get to see Germany being eliminated by Croacia on TV. The same Croacia we had eliminated 2 years before. In 2000 we beat Turkey in the QF and 2 years later the same Turkey was 3rd in the WC. We beat Germany 3-0 with our B-team in the process, together with Romania which went to the round of 16 in the 1998 WC and the QF in 1994 (we had seen it on TV). You pretty much covered the 2002 events, where btw we out qualified Holland (4th in WC 1998). We lost against the US and Korea. A draw would suffice against the latter. To comfort all of us, we got to see Turkey going to the semis and showing us how to beat Korea, in the match for 3rd place. The same Turkey which we easily defeated 2 years before. In 2004 we were only beaten by Greece and we beat Spain, effectively eliminating them. We lost the Final against Greece. In 2006 we go out in the semis of the WC playing against a tired France, with a team decimated by card accumulation (courtesy of HOL). Again, another scrappy penalty. Again, a France within reach. In 2008 we beat Turkey and the Czechs but lost against Switzerland. Again. In 2010, we played for the draw (courtesy of C Queiroz) against Ivory Coast and Brasil. Both well within reach, as Holland clearly showed later. When asked what went wrong, CR told reporters to ask C Queiroz. Shortly after, a huge number of players abandoned the Selecção and the qualification for 2012 was in danger. After that, P Bento picked up the pieces, invented the 3M midfield (in the absence of a #6 and #10) and lead us to the semis in 2012, where we were the only team to play Spain (Euro and World champions) eye-to-eye. Now, we beat Ghana (QF in 2010WC) rather easily and were, yet again, undone by the US. The same Ghana that gave Germany a huge scare. Sure, we lost 4-0 to Germany. Were they that good? No. Did they deserve it? Sure. We played well below our level and were decimated by injuries. So, it seems the heavy-weights were never really a problem. I´m more afraid of teams like USA, SWI, Northern Ireland, Armenia, Scotland or Denmark. What seems to make the world of difference is: 1) the coach; 2) whether it´s a world cup or a euro cup or a qualification match.